A loving, dutiful daughter writes about her desperate confrontation with her mother’s Alzheimer’s disease. Canadian author Borrie trained as a nurse, studied writing and theater arts, and competed as a dancer. Though she holds degrees in public health and law, her vocation is clearly creative nonfiction. Short passages, rendered in the immediacy of present tense, of childhood recollections and lonely adult life, alternate with conversations with an ailing parent. The memories of childhood are occasionally unhappy but more often idyllic. The brief passing scenes include the brutal death of a beloved teenage brother, a distant stepfather, and dismal days at boarding school. Borrie also recounts the halcyon days of gardening with her grandfather, boating with her mother, and enjoying tea and ginger snaps. Eventually, the mother-daughter bonding transformed into a deluge of dealing with her mother’s prescriptions, and family and friends drifted away. The author was briefly married to a man with a handlebar mustache. (That’s all we learn about the ephemeral husband). Ever more exhausted, Borrie, single again, visited her mother in her nursing home daily and talked with her many times a day until her mother was no longer able to use the phone. The author transcribes the conversations marked by her mother’s stream of consciousness and confusion; she never forgot to call her daughter “love” and “lovey” even as she ultimately forgot her name and identity. 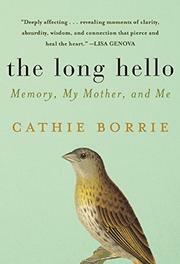 As Borrie presents them, her mother’s non sequiturs, surely a badge of Alzheimer’s, make a wonderful kind of poetry, mysterious and even witty. Finally, her wandering thoughts could no longer be expressed properly. The denouement is, of course, inevitable: her mother passed away, and the grieving daughter must deal with the aftermath. Journal entries combine for a short, poignant record of two lives, a moving history of a mother and her child.